I got an invitation to build a shop in the SL version of Ville Spatiale. Ville Spatiale (google) is an architectural/social/urban planning experiment by Yona Friedman that he made in the seventies. It has never been done in real life (although it has influenced a lot of people later) but german art curator Helfe Ihnen has built it in SL. I made my shop there in 4 hours, and i like the result. 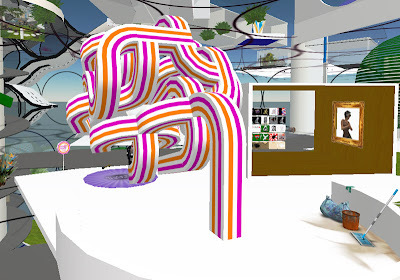 It leans towards the customer and the arms that have the avatars in them are scripted to point towards him or her too. And if you're wondering how everything became this white, here's how: All hard work. Hehe. 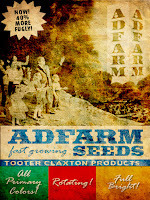 I decided to go into adfarming too. I want my name on bright ugly signs all over the metaverse! Yay! Nah. Just kidding. I did build this little adfarm. 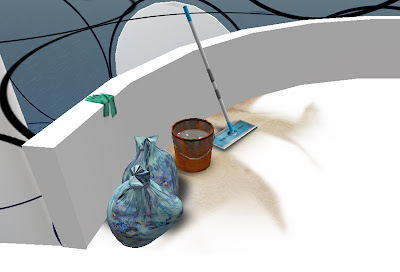 Free to take and modify at Oculea, Zimmy's Freebie Underground (F.U.) and the SLLU freebie shop. 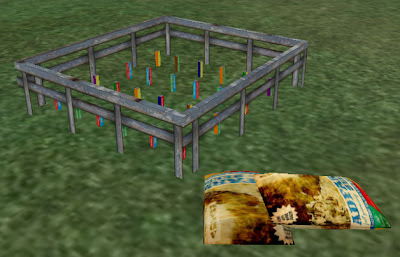 Hobo arts mogul and typo king Thinkerer Melville invited me to build something on his arts & communication sim 'Cookie'. I had an idea what I wanted to do, asked american scripteuse Paladin Pinion and polish artist Olza Koenkamp to join our new 'One man's garbage' group so we could build together. "Smysl word can obtain that it it loses motion vs, it shows during the period or disordered the demonstration of language cannot." after being translated into different languages over and over. I like that. I think it's funny. But Paladin found that it would take some scripting on a webserver too (working on that) so we settled for a grumpy sign that would just react sarcastic or negative to words said in chat. We considered giving it alternate 'moods', but as it is provoking so many (mostly negative) reactions we might just keep it this way :). The build itself has Olza's word receiver sitting a big pile of ears I made (that was easy, ha). On top of it is scaffolding which holds the sign. This is what it looks like. Go and try it. 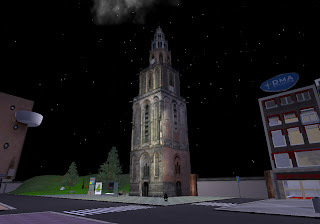 About half a year ago I built our local tower, the Martini Tower, because our local municipality wanted to 'do something' in SL. Turned out they didn't have any funds yet, but building that tower got me invited into a group (run by Ivo Krupinski of DMA media) that was already planning on a duplicate Groningen in SL. So I put the tower up at their place. They have a group of fun and very skilled builders and scripters, some of whom i have even met in RL, and of course i promised to help, but never really found time, as I was building other -cough- important stuff. But I did manage to reserve two shops along the way somehow. And I could put my magazine stand / shop out on the street, so basically i didn't need to use the space for my store. So I got some stuff from my inventory, added some, and built a rock club. 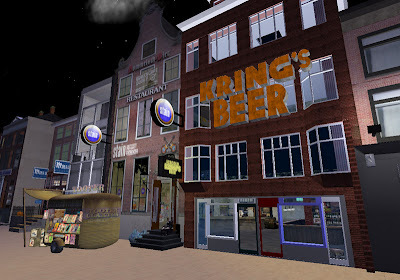 Something Groningen SL lacked, and which is one of the major tourist attraction in the real Groningen. I called it 'Stain'. 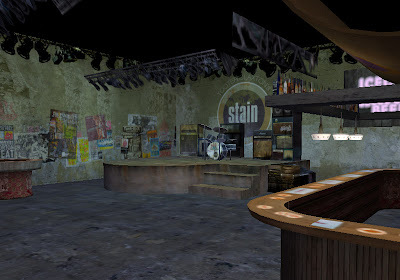 Because it's -well of course- filthy, and also the word stain means rock in our local dialect. I based the logo on the one I made for the (rl-) Vera Club about 12 years ago. They still use it, why shouldn't I? It's almost done (i.e. I'm almost out of prims) and now the question arises on wtf I'm gonna do with it... I'm not much of an SL party or concert organizer. So basically I either need someone to do something there or a good idea to get it to run by itself. Suggestions anyone?